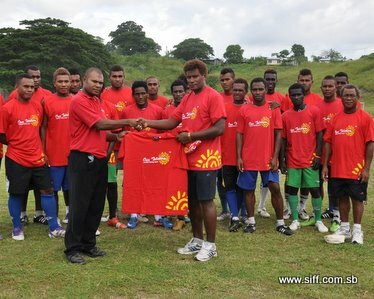 The team was handed 30 t-shirts which the team will use for training as they prepare for the Oceania Football Confederation (OFC) Men’s Olympic Qualifier 2012 which will kick off on March 16. The donation in kind was presented by members of the Our Telekom marketing team, Natalie Patternot and Lawrence Nodua to the Solympics squad during their training session this afternoon. Speaking on behalf of the squad, Solympics team manager, Gideon Omokirio, thanked Our Telekom for the support and said that such assistance encourages the players to work harder. “We thank Our Telekom for this donation which we feel that will help lift morale among our players and also make us look like a team during training. Our Telekom has always supported football and we are the latest beneficiary in the strong relationship Our Telekom has with this sport,” Omokirio said. Omokirio also appealed to other business houses to support the team saying that the Solympics will be grateful for assistance in kind from individuals and or businesses. “Community support is a major part of our morale building and I think Our Telekom is leading the way here. We hope that other business houses will step forward to back our players,” Omokirio said. The team today spent their final day with Brazilian Giovani Fernandes who has been helping them with their preparation since arriving in Honiara last Tuesday. Fernandes will leave the country tomorrow and the Solomon Islands Football Federation (SIFF) is working to organise for the team to meet up with him in Auckland.